Maravilla Building TWO, Ground floor UNIT 2103. Located just 30-40 steps to the pool OR beach......always less than a minute from your condo to any chair....beach or pool. Unit 2103: This is our recently updated ground floor unit with granite and welcoming decor. It doesn't get any more convenient than this if you have kids! You don't have to carry your beach bag, coolers, boogie boards, or towels far at all. The décor is upscale rustic coastal with an emphasis on "comfort"! It truly offers the "WOW" factor! 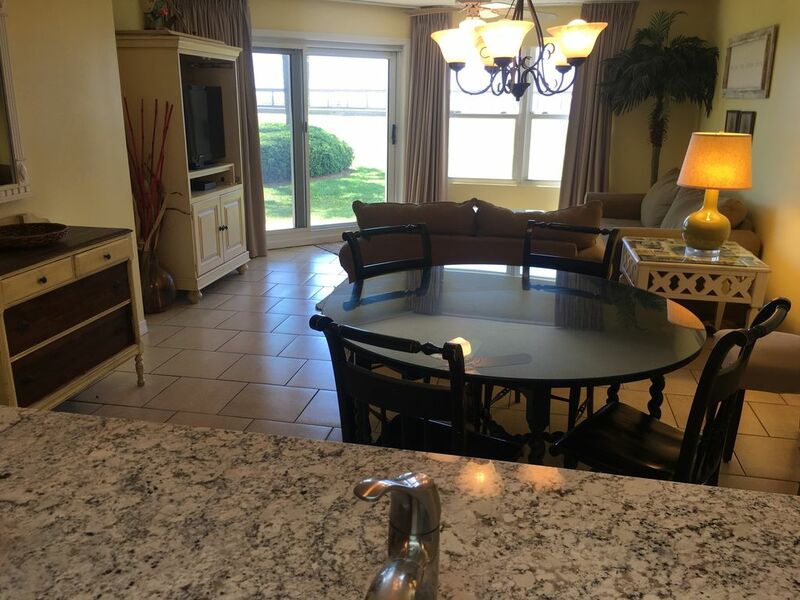 You can park at your front door and escape out the back door to the pool or beach! This unit sleeps 6 with a king bed and TV in the master bedroom, a queen bed in the guest bedroom with a TV and a queen sleeper sofa in the living room. This unit is very popular for families with small kids. You can lay out by your door or the pool while the little ones sleep. We keep a port-a-crib in the condo if needed. Ask us about our second floor condo that over looks the pool. Our condos offers Wireless Internet Access and free umbrella /beach chair set up! Your chairs are waiting for you in the sand so don't have to bother packing them! The Maravilla property offers two pools (one heated), tennis courts, a new workout room and schuffle board. It is located within 5 minutes of several golf courses, the Outlet Mall and Destin's newest shops and restaurants of Baytown Wharf! Many, many guests continue to choose Maravilla year after year. Come and see why! There is NOT a better family resort on Scenic Gulf Drive. Email ME! I would l love to talk BEACH with you! My family and I visited Destin in 2001 and fell in love with the white sandy beaches. Maravilla has been a tradition of our family for years. The rental busines has been a true blessing to each of us. It has allowed me to be a 'work at home' mom while raising our two kids and has given me the opportunity to meet many wonderful families from all over the United States. We purchased our properties with two non-negotiable factors in mind: 1) Views! We would not compromise on being able to see the emerald waters of the gulf while relaxing on our balcony. We are from Kentucky and our vacations are all about seeing and enjoying the water. 2)Proximity to the beach and pool. As a family with young kids we wanted to be quick to and from our condo to the sand. Our goal was always less than a minute for either and we purchased our condo's accordingly. As a result, our family enjoys truly relaxing vacations taking in the beautiful Gulf of Mexico. Regardless of where we are, the heart of Destin or Scenic Gulf Drive, our views don't change..the famous emerald water is only a glance away! Our family condo business is dear to us. We recognize how blessed we are and we cherish the memories! Purchasing a vacation home within driving distance to our home was important to us. It allows us to vacation often in our home away from home. The Gulf Coast's emerald waters were like no other place we had ever seen. The natural beauty of the beaches were the 'icing on the cake' for our purchase of our vacation home. Our kids have grown up at Maravilla. Our daughter learned to swim in the pool there. We have since purchased other properties as investiments. Maravilla remains our favorite. Our children will not go anywhere else. The property offers great 'kids friendly' playing spaces. Maravilla's neighborhood community is perfect for riding bikes, skating, playing tag, getting a wiffle ball game up and just doing things kids love to do. Many complexes today only offer a parking lot and a beach to play on. We LOVE Maravilla! TV/DVD/VCR located in the living room and each bedroom. We try to keep beach toys available. Rentals are available on our beach. Available for rental very close by. Rentals are available within a 10 minute drive. Paddle Boards and kayak rentals are available on our private beach. Several Golf courses are within a 10 mile radius.